Show/Hide Harvestbar toggle (icon) button. Expands for Volume Sliders & Graphic Display Presets. This addon is very nice. Any chance that it will be updated and fixed for the newer GUs? Also found a bug when you click the charm, earring or food/drink slots on the panel it reads one click as two, so that it tries casting your horse twice, so you get a Already Casting.. message or you use 2 food or drink when you click it. Also, the harvest info page is wrong in terms of the Tiers, tiers go from T1 1-9, T2 10-19, T3 20-29, etc. They are currently listed as 1-10, 11-20, 21-30 etc and its wrong. Otherwise this is a very nice addon and I use it alot. Is there any chance this will get updated as it was a great addon. Updated to now include harvestbar + harvest reference list. Tested compatible with Fetish Nightfall 8.2 (and GU30). I also included the text file how-to's for setting up the sound sliders and video presets (use at your own risk and only if you are comfortable with xml). I have the same problem with some of the slots not showing up, and the info window alot of the info is missing, but then on some of my chars everything works fine. It don bother me to much i still use it. But thought i put in that its working for some of my chars but not for all of them. If this helps fix the prob at all. Following a proper install, Fetish (and any other mods) installed first then this mod installed into the ui folder (must overwrite files) I am unable to reproduce any missing icons and such so I have no idea what would be causing that. Last edited by Krull : 01-02-2007 at 06:54 PM. I read in another thread that to get the Master Sound to stay where you put it and not revert back to no sound (0.050) to edit a couple of files. They also mentioned that the files to edit were mentioned in the instructions packed with the zip file OK then easy enough except I can not find any instructions in the Command Center zip = I just downloaded the newest release and still can not find the readme-- Please give me a link or something.. I've deleted these files which has returned control of these settings to the main options window rather than the extended command window which I never used. Alternatively you can edit the value="1" at the end of the file. You can change the value up to the number given by Upperlimit. Just a minor irritation - everytime I login/switch characters my sound volume is set back to 0. Other than that its a great add-on! Is this a common problem for everyone else? Have been using Fetish for a long time and I love it, but I installed this on top of it and it worked great the first time I logged in, but when I log back in now, the control center is gone AND all my options are all changed. Please help. Also check in user interface/game windows that you do not have it to where windows can be offscreen, if it is try clicking that one so they will not be allowed offscreen, then look for the option that resets window location defaults so that if it is offscreen it will relocate to a default position. Other than that only thing I can think of would be to try reinstalling the mod and overwriting files and if it still happens then I got no clue. Just wanted to say thanks again. Since I was monitoring this thread it actually seemed like you hadn't fixed Fetish yet, but you have and all is right with the world again. Last edited by Krull : 09-10-2006 at 01:32 PM. Damn, I miss my command center, my finger twitches to that little macro button for it every time I log on now. Even though that will make me immediately crash. It's virtually the first thing I do after logging on. Pop up the command center! Indeed GU27 patch today has broke compatibility with this mod and I will be looking into it. I will update the download and this post when I have more info or a fix. There seems to be a problem with the Command Center and the update today. 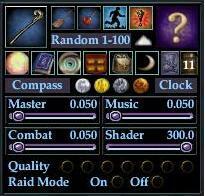 My game crashes upon login unless I remove/disable the file eq2ui_mainhud_startbutton.xml. This happened during the last major update as well. I'm assuming others have seen it, and I'm just awaiting a fix.